Kriti is an academic associate at SHM, and a lecturer in Anthropology and Law at Kings India Institute. She specialises in socio-cultural research, illuminating our work with her academic knowledge and expertise, and bringing academic rigour and analysis to her approach. 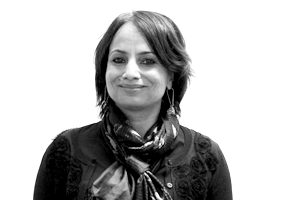 For SHM, Kriti has worked on a range of projects in the health, social and higher education sectors. She led the research for a major behavioural change strategy for a government health department and also for a social study into the behavioural patterns of young people for a French Ministry department. She has also worked with international councils for business studies to develop innovative business solutions based on insights from the humanities. Kriti studied at the Jawaharlal Nehru University, New Delhi, and did her PhD at the London School of Economics. She subsequently held the British Academy Postdoctoral Fellowship at the Department of Social Anthropology, Cambridge, and was also a Fellow at Wolfson College, Cambridge. She is also Co-Director of Herald, a project aimed at facilitating the setting up of emergency healthcare in different parts of the world. To meet another member of the SHM team, click on a name from the list below.